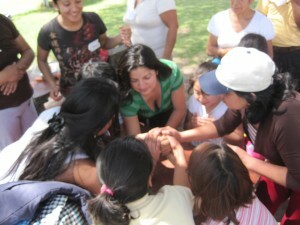 Mujeres Unidas is a reg­is­tered asso­ci­a­tion in the coun­try of Peru. It does not have 501c3 sta­tus in the United States, because of the organization’s grass­roots nature and to elim­i­nate the need for over­head costs. One hun­dred per­cent of all grants and dona­tions go to imple­men­ta­tion of pro­grams. It is purely led by and com­posed of girls and women in the com­mu­nity. The orga­ni­za­tion is not affil­i­ated with the gov­ern­ment, polit­i­cal par­ties, other NGO, or any reli­gious institution. To donate, please click the “DONATE” but­ton on the right side of your screen. Where will your money go? One-hundred per­cent of your money will be used towards the des­ig­nated pur­pose of the dona­tion because all the work for Mujeres Unidas is done on a volunteer/community ser­vice basis. The women are striv­ing to be self-sufficient in three years (by 2013) and hope to raise funds within these three years to meet all of their objec­tives so that they can ful­fill this goal of self-sustainability. We are cur­rently work­ing with tax experts to see if tax exemp­tion for dona­tions made to Mujeres Unidas might be a possibility.